Image caption The number of US troops in Syria is three times higher than official counts, according to a Pentagon report. The number of US troops in Syria and Iraq is significantly higher than acknowledged by Pentagon officials, a US defence department report shows. Officially there are 503 US troops in Syria and 5,262 in Iraq. However, the Pentagon's quarterly report puts number of troops as 1,720 in Syria and 8,892 in Iraq. 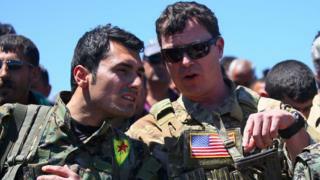 US soldiers are there as part of the fight against so-called Islamic State (IS) and include trainers, advisers and special forces. US Defence Secretary Jim Mattis said earlier this year that the number of troops operating in Iraq, Syria and Afghanistan would be reviewed. However, only the troop numbers for Afghanistan have been publicly revealed. Pentagon spokesman Rob Manning said on Monday that security concerns and political sensitivities prohibited full disclosure for the time being, but he pledged to be "as transparent as" possible. The US has had a troop presence in Iraq since the invasion of 2003, reaching 168,000 at its peak in September 2007. In Syria, the troops are largely stationed in the Kurdish-led region in northern Syria and helped Kurdish-led militias to recently capture Raqqa, the de facto capital of IS. Last week the Pentagon said it was reviewing "adjustments" in military support it gives to partners inside Syria. These include the Syrian Kurdish militia known as the Kurdish People's Protection Units (YPG). Turkey said on Friday President Donald Trump promised to stop supplying arms to the YPG, which Ankara considers a terrorist organisation, though this has neither been confirmed nor denied by Washington.